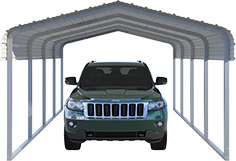 Garage units are more secure than ever thanks to new and improved security tech. And getting it is as easy as visiting an online retailer who specializes in home security. Examples include smart garage door motion sensors, video surveillance, garage door openers that can be controlled from your smartphone and laser parking guides. With the right gadgets (and a quality unit to begin with), you’ll be at peace with the knowledge that your garage is protecting and monitoring your valuables. Whether you’re at home or out of town, you can rest-assured that your items are safe. A brand-new VersaTube garage unit will reduce your stress because it makes self-storage easy. 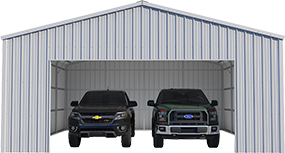 Whether it’s family heirlooms, seasonal decorations, hobby supplies that have outgrown the corner you used to keep them in or something else, a steel garage makes a convenient, safe storage location. With a well-designed VersaTube garage unit, you can actually add additional living space to your home. A clean and organized garage can make a fantastic place to host an outdoor party that’s sheltered from the sun, wind or rain; can double-up as a man cave; and more. Let your imagination run wild! A garage will help to eliminate clutter and organize your home. In turn, you can reduce any anxiety or stress related to a home in disarray and experience peace of mind. Studies show that a clean, organized living space can do wonders for your mental health. 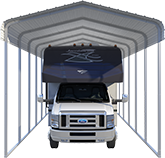 Home is a place where you should be able to relax, and a properly utilized garage can help you do that! A garage that is properly ventilated and secured, is one of the best places to store valuables such as heirlooms and antiques. If you keep your valuables in your home, they’re exposed to factors that risk depreciating their worth. If your items are both sentimental and valuable, you likely want to keep them in their best condition. Many people keep heirlooms throughout their lives, planning to sell or pass them on to future generations. Unfortunately, not every home has enough space for them, and many homes have environments that are unsuitable for certain valuable belongings. A garage unit with a controlled environment and proper ventilation is an ideal location to secure your valuables. Ready to take the next step and order a VersaTube Garage Kit? Reach out to us today by visiting our Contact Us form or call us at 888-775-1560.